National Copy Systems, located in Scottsdale, AZ specializes in Xerox copiers and multifunction products. We can handle all your document needs. We provide sales advice, a wide variety of supplies, and same day service. Whether you are a home office or a large commercial account National Copy has the right products and service to suit your needs. Xerox has been long recognized for their award winning products. 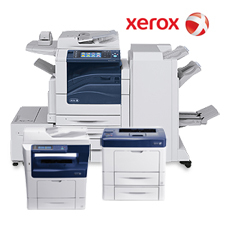 Xerox products are known for their superior performance, reliability and affordability in both office equipment and document management. Due to the breadth of Xerox's product line we can insure that we can provide you with a product that exactly matchs you individual company's needs. National Copy Systems' personal service, combined with outstanding Xerox digital Copiers, Printers and Fax Machines, provide a logical solution for your office document needs.